It looks like Canadian real estate is in for a slower-than-usual autumn. The typical back-to-school September buying rush was notably subdued this year, reveals the latest national market analysis from the Canadian Real Estate Association (CREA). According to September’s data, home sales have plunged 11 per cent year over year nationwide, though are up slightly from August activity by 2.1 per cent. Three quarters of the local markets tracked by CREA saw a decrease in buyer demand and, compared to the peak experienced in March, is down by 12 per cent. 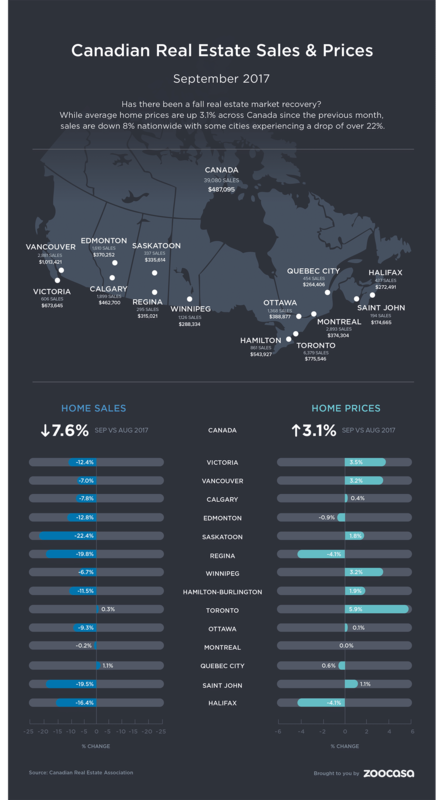 Check out how prices and sales compare to 2016 activity in Canada’s largest markets in the infographic below. Is It a Better Time to Be a Buyer? However, that may not mean it’s time to make a move on those townhouses for sale in Toronto or Hamilton real estate listings – prices are still on the rise, increasing in all 13 major MLS markets by 2.8 per cent to a national average of $487,000. It should be noted, though, that this price growth is occurring at a slower pace than last year, and is driven primarily by more affordable housing types – condos are seeing the hottest demand, while sales flag further in the detached segment. Sale rose 19.8 per cent for multi-family housing, followed by townhouses at an increase of 13.5 per cent, and one-storey and two-storey detached homes at 7.9 and 7.2 per cent, respectively. Buyers should also note that the sales-to-new-listings ratio reveals balanced territory in two thirds of all local markets in 2017. This ratio, which is calculated by dividing the number of new listings for sale by the number of sales, indicates whether demand is outpacing supply, and can help buyers assess how competitive their local market may be. Nationally, the ratio fell slightly, from 57.7 per cent to 55.7 – well within balanced territory, CREA reports. The association considers a ratio between 40 – 60 to be balanced, with levels below and above to be buyer’s and seller’s conditions. The level of inventory, which refers to the amount of time required to completely sell off all available homes for sale, is five months on a national level. It all points to stabilizing market conditions – but CREA’s analysts warn it’s too soon to tell if a trend is emerging. “National Sales seems to be stabilizing, While encouraging, it’s too early to tell if this is the beginning of a longer-term trend. The national result continues to be influenced heavily by trends in Toronto and Vancouver but housing market conditions vary widely across Canada,” stated CREA President Andrew Peck. Gregory Klump, the association’s chief economist, pointed to new OSFI mortgage rules, saying that not only could they shake up the market, but also weigh down economic growth.